The plot drives me mad, between the idea that no one can possibly be fulfilled without children and the sheer ponderousness that results from taking “The Magic Flute,” layering on another dozen characters, replacing the Masonic allegories with something Hoffmansthal made up, and carefully cutting out all the wit and humor of the Mozart. Still, the music glitters and thunders, and the Empress’s transformation scene, done well, is one of the great scenes in all opera. But then I have to put my head in my hands during the damned chorus of unborn children–sheesh! Hahahahaha! So it wasn’t just me. Lisa was also kind enough to recommend to me some recordings of the opera: this full recording of a Wolfgang Sawallisch production and two cut versions conducted by Karl Bohm and Herbert von Karajan. I asterisked The Descent because I know Terry won’t like it: it’s a bloody, terrifying horror movie that I happened to like enough to put on this list. Not Terry’s cup of cocoa at all. Some honorable mentions that provided solid entertainment or better are Fracture, Dan in Real Life, Michael Clayton, Sunshine, and The Family Stone. And tomorrow you’ll probably hear about the half dozen movies that I forgot! Like Terry, I’ll be pretty much dark for the extended Christmas. So until next time, happy holidays, one and all. I can’t tell you how many times I have looked at George Balanchine’s The Four Temperaments, but though I suppose the day may come when it no longer has anything new to say to me, I still find it a source of apparently inexhaustible interest, and try to see it at least once a year. Every art form has produced innumerable masterpieces which, like The Four Temperaments, demand to be experienced repeatedly–every art form, that is, except for series television…. Hill Street Blues was the first TV drama I ever went out of my way to see, and were there world enough and time, I might even consider watching the first few dozen episodes again. But while I still remember how much I liked Hill Street Blues, I can’t recall much else about it–only a few isolated moments from two or three episodes–whereas I could easily rattle off fairly complete synopses of, say, Citizen Kane or A Midsummer Night’s Dream, or whistle the exposition to the first movement of Mozart’s G Minor Symphony. To qualify as a classic, a work of art must first of all be good enough to make you want to get to know it at least that well. Will any TV series ever be good enough to fill that exalted bill? I mention all this because American Life TV, a cable channel of whose existence I only just became aware, is now showing reruns of Hill Street Blues every Sunday. Hill Street Blues was, most TV historians agree, the first hour-long cop show to break with the old-fashioned style of TV drama. Every contemporary series whose plots are arranged in multi-episode “story arcs” and whose characters are photographed with hand-held cameras and portrayed with a combination of tough-minded realism and rough-edged humor is a direct descendant of Hill Street Blues, which I watched faithfully throughout most of its six-year run and thought at the time to be the best TV series ever made. “Chipped Beef,” which first aired on December 17, 1981, midway through the second season of Hill Street Blues, was one of the first episodes I saw–maybe even the first. Yet when I sat down to watch it a few weeks ago, I was astonished by how clearly I remembered bits and pieces of the plot, and–more important–by how fresh the show had remained after a quarter-century. I started watching it purely as an experiment, but in minutes I was completely engrossed all over again, and since then I’ve watched two more episodes and liked them even more. Am I viewing Hill Street Blues through nostalgia-colored bifocals? Probably. I have no doubt whatsoever that part of the appeal it holds for me now is the way in which it reminds me of myself when young. That was half a lifetime ago and half a continent away, back in the days when I lived in a suburb of Kansas City, worked as a teller in an inner-city bank, reviewed concerts at night, played jazz on weekends, and had yet to visit an art gallery or eat a bagel or or meet any of the people who are now my best friends. I don’t know whether the world was simpler then, but my world was both simpler and a good deal more innocent, and it was still possible for me to be pulled up short by a well-written, well-acted TV show whose makers reminded us each week that life is hard and the good guys don’t always win. Nowadays I spend too many nights on the aisle to commit myself to theater on the installment plan. 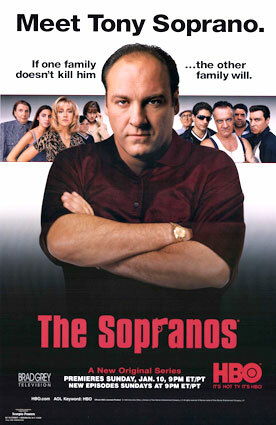 Not even The Sopranos was capable of holding my attention over the long haul. When I gave it up midway through its fourth season, I also gave up series TV. Buffy and Gilmore Girls were my last such ventures, and I watched them in batches (courtesy of Our Girl) rather than week by week. 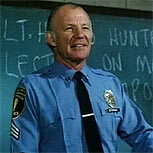 But I intend to stick with Hill Street Blues for a little while longer. After all, man cannot live by masterpieces alone, and for now I find that it amuses me to spend the odd hour watching Frank Furillo, Phil Esterhaus, Captain Freedom, and the men and women of Hill Street Station doing battle with the lengthening shadow of urban decay. Even if it isn’t exactly a classic, it definitely beats Law and Order all hollow. The first and second seasons of Hill Street Blues are available on DVD, and the first three seasons can also be purchased from iTunes.